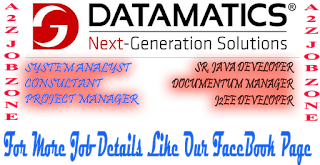 At Datamatics Global Services, we are keen that you make a solid foundation for your future by gaining critical experience on cutting-edge technology projects. It's another effort in our endeavor to be an employer of choice. We believe that we can bring the best out of you by providing an environment that breeds talent and encourages high-quality performance. We created such a workplace culture keeping in mind the top quality projects we handle for our prestigious clients, some of whom figure prominently in the Fortune 500 list. Must have design experience and implementation expertise on multi-tier, highly available, scalable, performance-oriented, distributed transaction environments. Iterative and agile methodology based project life cycle. J2EE compliant enterprise application server (BEA WebLogic). XML, SOA and Web Services. Frameworks such as AWT, Struts and Hibernate. Very good hands-on experience on Documentum products. 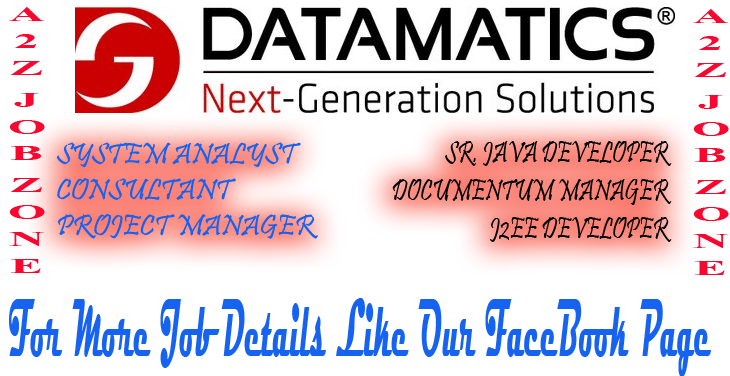 Must have worked on multiple Documentum products like WDK-Webtop, DFC, Docbase, DFS, Taskapce, Process Builder etc. Very good hands-on experience on T-Sql and oracle database server.